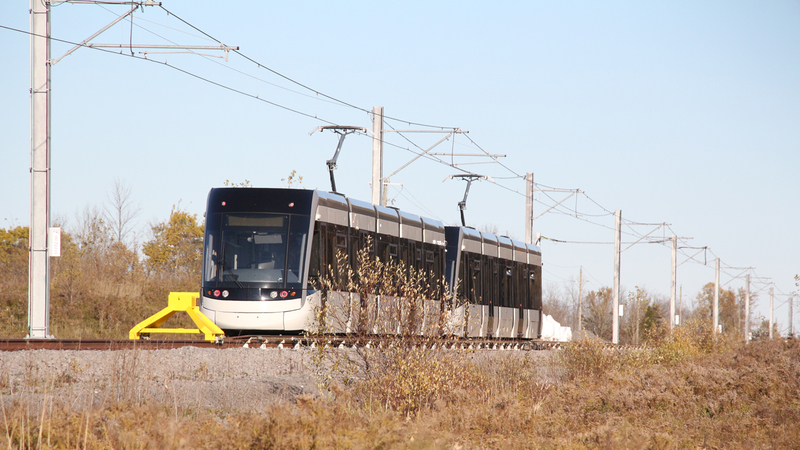 A two-unit Eglinton Crosstown LRV on the test track at Bombardier’s Millhaven, Ontario plant. 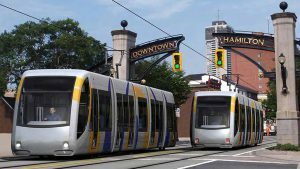 Hamilton’s LRT is to extend from McMaster University in the west end to Eastgate Square shopping mall in the eastern part of Hamilton. 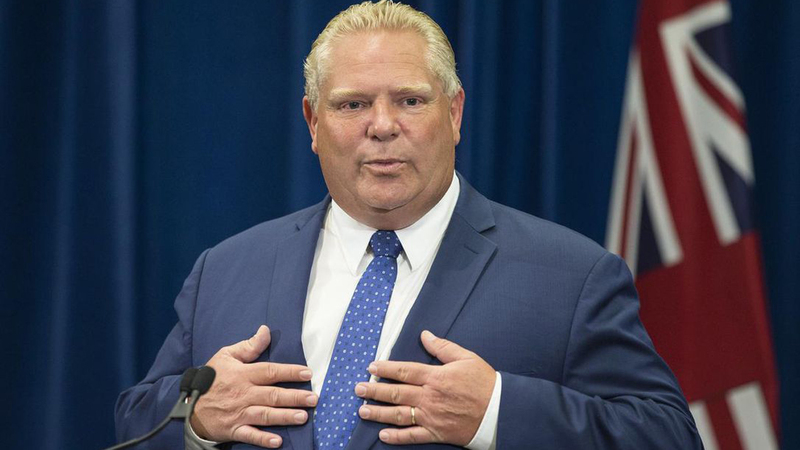 Conservative Ontario Premier Doug Ford recently stated that the provincial government’s confirmation of C$1 billion for the crosstown LRT, the city’s first, remains firm. The commitment was made about two years ago by the previous Liberal government. In recent months, there has been some uncertainty as to the status of LRT funding, due to an earlier Ford statement that the money could be provided for other Hamilton infrastructure projects, if the City Council voted by a majority to cancel the project. Although council had previously given the project unanimous approval, several councillors, including some newly elected members, are threatening to vote against it in 2019. It has been a controversial issue among Hamilton residents, largely due to a lack of understanding of its merits, or simple parochialism. Ontario Premier Doug Ford. Photo courtesy The Toronto Star. However, Ford, in his remarks, stated in effect that the recent re-election of pro-LRT Mayor Fred Eisenberger, who defeated an anti-LRT candidate by a significant margin, proved to him that there was significant support for LRT in Hamilton. “He wants an LRT, he’s going to get an LRT,” Ford (brother of the late and highly controversial former Toronto Mayor Rob Ford), said. Mayor Fred, as he’s popularly known, said that he expected to be meeting with Premier Ford before year’s end to discuss the LRT. One contentious issue would be the recent freeze on property purchases for the line, allegedly in the name of deficit reduction. Metrolinx has stated that the freeze remains in place for the time being; about 50% of the property required has already been purchased. In a related development, preliminary work was scheduled to begin during the week of Nov. 26 for an LRT-only bridge over Highway 403 in Hamilton’s west end. The location is Cathedral Park, which is on the east side of the highway valley, across from Hamilton Cathedral. Consultant AECOM studied potential locations for bridge foundations in the grassy area of the park, which sits over a large underground sewage overflow tank. The work includes removing soil with hydro-vac equipment to ascertain the tank’s boundaries. Ontario’s previous Liberal government approved expansion of GO Train service to Grimsby, St. Catherines and Niagara Falls, but Metrolinx President and CEO Phil Verster sent a letter to the Niagara Region GO Implementation Office stating that, according to a revised policy, Metrolinx will no longer fully fund construction of new GO stations. Instead, the province wants private-sector businesses to become partners in station construction, ownership and operation. This policy would see stations integrated with commercial and residential development. The proposed stations in the current GO Niagara plan were designed with the assumption that they would be entirely built and funded with public money. 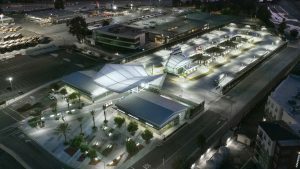 Their planned locations may be incompatible with development located beyond the stations and parking lots. The Niagara Region GO Implementation Office has asked Metrolinx for clarification regarding the new policy, which could be seen as an effort by the provincial government to reduce Ontario’s major deficit. However, Metrolinx has confirmed that planned construction of the Confederation GO Train station on Centennial Parkway in east Hamilton will proceed as planned. Tenders were released in November, and the C$35 million station is scheduled to be ready for service in late 2019. On October 30, 2018, the author, representing Railway Age, visited Bombardier’s Millhaven, Ontario, plant, located near of Kingston. The occasion was a ribbon cutting ceremony for the first TTC (Toronto Transit Commission) Flexity Outlook LRV completed at this facility, No. 4572. Bombardier has split the completion of this contract between its Thunder Bay and Millhaven operations, to expedite deliveries. 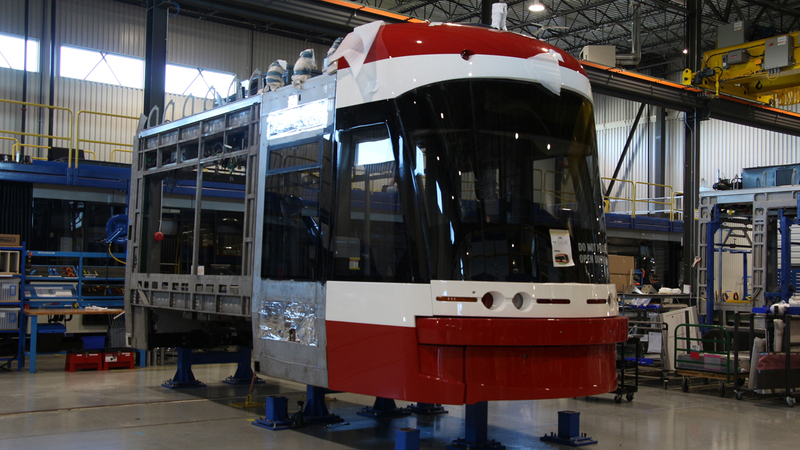 A section of a TTC Flexity LRV on the Millhaven shop floor. Thunder Bay will build cars up to No. 4571, while Millhaven plans to finish TTC’s much-delayed 204-unit contract with No. 4603. Bombardier is hopeful that this goal can be achieved by the end of 2019. 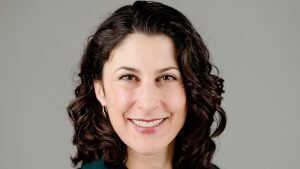 The status of the TTC’s option for an additional 60 Flexities has not been announced. Bombardier, at the time of the visit, was completing a TTC-gauge test track for the Flexities. A line truck was observed, installing overhead trolley wire. Former Bombardier Transportation Americas Division President Benoit Brossoit, who not long after this event was replaced by Lee Sander, and David Van Der Wee, Chief Operating Officer, answered questions from media in attendance. 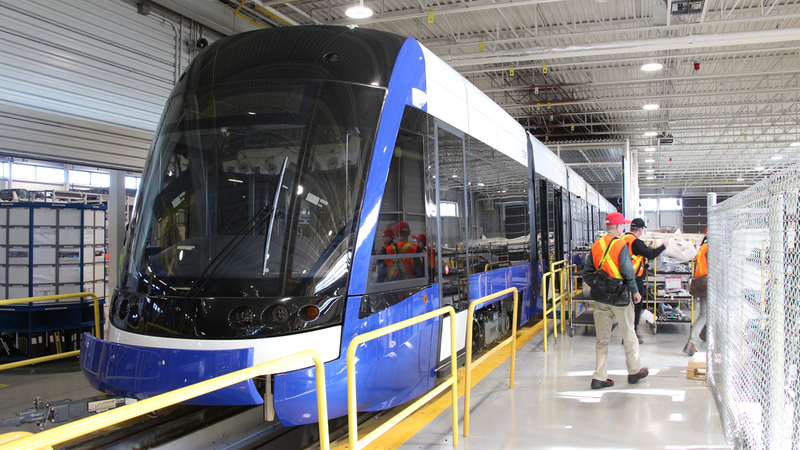 Brossoit admitted that his company has suffered many well-publicized problems with its LRV deliveries to Toronto and the Waterloo Region, but stressed that major efforts have been made during the past couple of years to correct these issues. Guests were then taken for a test track demonstration ride aboard an LRV destined for Toronto’s Eglinton Crosstown LRT, scheduled to open in late 2021. These Flexity Freedom cars are similar to the 14 assembled for the Waterloo Region ION LRT, the major difference being control cabs at just one end. In service, the cars will operate as two-unit married pairs. Bombardier has committed to have six of the Eglinton Crosstown LRVs ready for shipment by the end of February 2019, of which at least one should actually be at the Mount Dennis Yard by that time. Twenty-five cars are scheduled for 2019 delivery, with the 76-unit order to be completed during 2020. 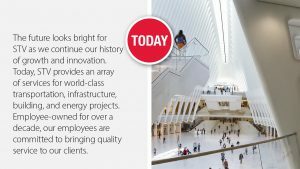 It remains to be seen where the full order will be distributed, as the Crosstown is initially projected to require about 44 Flexities. These cars, surprisingly, are painted grey along the windows, rather than Metrolinx’s standard green. In late 2017, Metrolinx cut Bombardier’s Eglinton Crosstown car order significantly, from a $770 million, 182-car order to the current $392 million, 76-car order. Metrolinx placed an order with Alstom for 61 Citadel Citadis LRVs, which feature a larger passenger carrying capacity than the Flexity Outlooks. This action was taken as the agency had strong doubts concerning Bombardier’s ability to deliver the order in time for the Crosstown’s opening. Delivery of the Alstom cars will commence in mid-2021; they will be assembled at a plant in Brampton, Ontario. Some of the cars will be taken to the Finch West LRT yard/shop complex, on the north side of Finch Avenue just east of Highway 400. This line is expected to require about 17 LRVs; the balance presumably would be distributed to Mississauga and Hamilton. The first Flexity from Millhaven will likely be shipped to the TTC soon, after a thorough inspection at Millhaven by Metrolinx staff. The first few Crosstown cars, at least, will be delivered by truck, as the Mount Dennis yard currently lacks a rail siding (a Canadian Pacific main line passes its western boundary). Provision has been made in the yard’s track layout for such a siding; thus, future deliveries may be on flatcars. The Millhaven plant’s standard-gauge LRV test track extends for about one kilometer, to the complex’s western property limit. A loading ramp has been constructed here, presumably for the Crosstown cars. Five retrofits have been performed at Millhaven on Waterloo Region’s 14-unit order. At time of writing, three of these cars remained at Millhaven awaiting release, although car No. 510 has subsequently been observed en route to Waterloo. The plant is connected to CN’s Montreal-Toronto main line by a long siding. During the tour, several of the seven-section Flexities for Edmonton’s Valley Line low-floor LRT were seen in various stages of assembly. 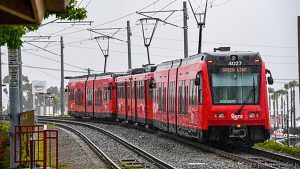 The LRT is scheduled for a late-2020 opening. These cars are painted in an attractive blue, white and black livery. Edmonton Transit Valley Line LRT seven-section low floor Flexity LRV on the Millhaven shop floor. A completed Vancouver Skytrain car was also observed. These cars use the Linear Induction Motor (LIM) propulsion system incorporated on the TTC’s Scarborough RT and Detroit’s Downtown People Mover (DPM). The Vancouver cars are significantly longer, however. The Millhaven complex occupies 480 acres in an essentially rural area. It was opened by the former Urban Transportation Development Corporation (UTDC) circa 1978. Its original function was the construction of cars for Scarborough, Detroit and Vancouver, and certain overseas cities. Bombardier said that it has invested C$20 million in the Millhaven property in recent years. Of this amount, $11 million was to double the manufacturing space, to 45,000 square feet. The facility employs about 400 engineering, manufacturing and administrative staff. All Bombardier Millhaven plant photos by the author.